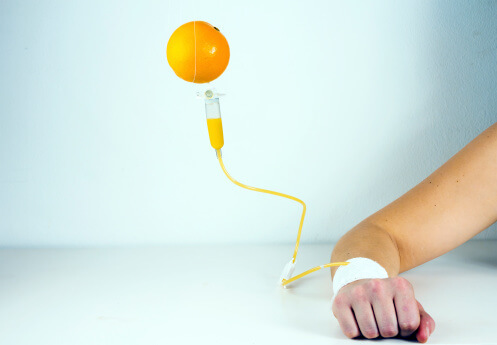 Are Vitamin Infusions Worth All The Hype? Las Vegas is America’s adult playground, but it can definitely take a toll on you if you overdo it. We’ve all been there! If you happen to be in Vegas and desperately need a cure for a hangover, dehydration or exhaustion, paying a visit to REVIV, an IV drip spa, may be just what you need. IV drip spas, where people can get a cocktail of nutrients injected directly into their bloodstream via an IV, are actually all over the United States. Also called vitamin infusions, these vitamin injections are sometimes simply given as a shot (like if you were to walk in and get a flu shot at your local drug store). Some even say these injections will improve sexual function. If you were to visit one of these IV drip spas, it would be pretty comparable to ordering at a smoothie or juice bar. “Brain Boost” - to help with your ability to concentrate. Treatment delivers taurine, an amino acid that may play an important role in creating new brain cells. The injection also includes B vitamins and vitamin C, which may stimulate and balance neurotransmitters. “Party Prep” - offers 11 nutrients that will keep you hydrated and energized before you attend a big event. These treatments are not cheap. On average, they cost about $100 to $175. Depending on what spa you visit, vitamin IV drips can take anywhere between 15 to 90 minutes. Some celebs, including Rihanna and Gwyneth Paltrow, swear by vitamin drips for boosting immunity. One woman spent thousands of dollars on these drips, despite some medical experts saying they are a waste of money in her case. Well, we know IV delivery of nutrients and medication is utilized in the hospital setting for treating patients. Intravenous fluids may contain potassium, glucose, and sodium, which are electrolytes your body needs to function normally. And medical professionals may use IV lines to deliver drugs directly into the veins, which helps them reach the bloodstream more quickly than they would if you took a capsule or tablet. IV drugs are also useful for treating people who are vomiting and cannot take oral medications. However, other medical professionals are waiting for hard science to decide whether this method of treating sepsis is effective. Some people against vitamin IV drips argue it is useless, because infusing vitamins through your veins bypasses the GI system. According to some doctors, circumventing your digestive system may put your health at risk. That’s because your digestive tract has several layers of defense—from antibodies in your saliva to your liver— that filter out potentially harmful molecules that could cause an allergic reaction. But others believe that skipping the GI system is the reason why these treatments can be so effective. “With vitamin C, for example, it’s immediately available for cellular use when you infuse it directly into the veins. But the same amount would cause G.I. upset if you tried to take it by mouth,” according to one medical doctor. It is important to note that these vitamin IV drips should not be a viable long-term solution to any medical problems you may be having. If you’re hungover in Vegas, it may be a quick fix. But if you are someone who has chronic fatigue or always getting sick, you need to get to the bottom of why you have these symptoms and perhaps make appropriate lifestyle changes, like exercising more and eating healthier. There is always a risk of infection with needle use, but it’s likely no more riskier than getting a flu shot or having a regular IV at the hospital. If you take too much of a certain vitamin or mineral, this can be toxic. One doctor says he doesn’t use anything that could reach toxicity levels quickly. And since these treatments use water-soluble vitamins, any excess would be filtered by the kidneys and eliminated through your urine. Model and member of the Kardashian clan Kendall Jenner was not long ago hospitalized due to a bad reaction from a vitamin IV drip. (These treatments are not FDA endorsed or regulated). There are not many details on what exactly happened to Jenner, but she recovered pretty quickly. What you really have to be mindful of is the person giving you the drip. These treatments are often done in spa type environments, and not your doctor’s office, so in some cases you are kind of like letting someone else play doctor. You have to do your research and make sure you are going to a reputable place. “More serious complications of an IV treatment can include a blood clot or inflammation of the vein. Although very rare, improperly inserted IVs can create a stroke-causing air embolism or cause the fluids to leak into nearby tissue,” according to the doctor in this report. Of course if you have any existing health issues or are pregnant or breastfeeding, speak with a competent healthcare professional about whether vitamin drips are appropriate for you. And always remember, being healthy is about your day-to-day care: what you are eating, not smoking, exercising, drinking in moderation, managing stress and visiting your doctor on an annual basis. So are infusions worth the hype? I have benefited from infusions of Vitamins C and B becasue I have such difficulty absorbing enough of these vitamins from food or supplement form. There is enough evidence to suggest that infusions may indeed be worth the hype and the benefits may far outweigh any risks associated with them. So if you have confirmed that you are deficient in certain nutrients and want to experience quick results, this may very well be one avenue you want to consider as a short term fix until you figure out a long term solution.